You've spent a career building a great business. You might have been at it for twenty, thirty or more years. It's now time for you to start thinking about the next stage in your life. Before you take the leap and decide you really do want to move on, you need to make sure it's not only the right thing for you to do from a personal standpoint, but a financial one as well. 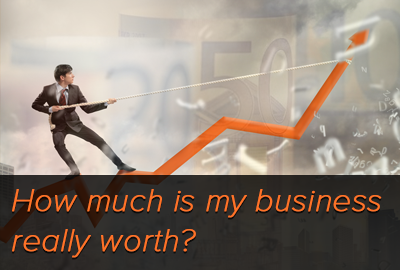 When I say how much is your business worth I mean how much would you be left with after you've sold it. To figure this out you need to go past what you're going to sell your business for. You already know that you're going to have factor in the cost of taxes in your sale. You also need to know what the other costs of the sale will be. If you decide to sell your business to a third party you're going to have fees for the intermediary who sells your business. This could run as high as 10% of the price you get. You're going to be paying your CPA to help you figure out what the tax bite will be. You'll be paying your attorney to help you with the legal aspects of the sale. All of these different costs add up. You could lose 50% of more from the proceeds of your sale. If you thought your business would produce enough for retirement, you might have to re-think this. Before you decide to leave your business you're going to want to know how much money you spend every year. Your financial planner will ask you this as one of their very first questions. The easiest way to figure this out is to take out your checkbook and bank statements and add up what your expenses are. If you want to get a little more detailed, feel free to categorize the expenses. Make sure you include what you spend through your credit card as well as what you have automatic withdrawals from checking account. I bet you're going to find the number is much higher than you thought. How much of my personal lifestyle is paid for by my business? This is a big question. One of the reasons owning a business is so attractive is because at least some of your personal life style expenses are probably paid by your business. And they're paid on a pre-tax basis. What this means is your business might provide you with a car. Your business gets to deduct part of the cost of having a car. Once you sell your business, you no longer will be able to deduct any of the cost of having your car. You're going to need to factor in what these costs are when you start thinking about your financial plan. Make sure your financial planner factors all of these costs before you decide you can sell your business. Do you investments outside your business? The answer to this question is too often no, or not much. I often tell my business owner clients the reason they want to *diversify their investments isn't for safety, it's because you won't be able to afford to leave your business unless you have a significant amount of investments outside your business. Some of these investments might be your 401(k) plan, commercial and rental real estate you might own and other investments you've made. You're going to find that without these investments it's going to be almost impossible for you to leave your business. Where am I going to live after leaving my business? There are high cost of living variations in different parts of the country. The cost of real estate is different, property taxes are different and income taxes are different. You might live in an expensive part of the country like the Northeast or the Pacific West. If that's true, you can dramatically lower what your economic needs are by moving. The downside of this is you'll be leaving the roots that you've established. You and your family will have to decide whether you can find a satisfying social life if you leave where you've spent most of your adult life. When you're thinking about leaving your business make sure you include your spouse in this conversation. You can be sure they'll have their own opinions about what the right thing to do is. How much risk will I be willing to take when I sell my business? Most private businesses are not sold for 100% cash at closing. Instead, they're sold for a percent in cash and the rest as either a sellers earn out or sellers note where you're playing bank for a potential buyer. There is a great deal of risk in these financial deals. If you're planning on this money for your retirement, there's a good chance the money will never appear. There are way too many war stories about deals here the owner held paper and never got paid. I like to encourage my clients to only consider the money they get at closing as the real purchase price for the business. Anything after that should be considered a bonus. Have I gotten around to doing a financial plan? There's lots of information you need to gather to figure out if you're financially ready to leave your business. I know this is self serving and the fact is you would get a great deal of value with working with a financial planner who understands the world of private business exit strategies. This type of planner will ask you the right questions and you'll likely learn that you have some work to do before you leave your business. The good news about this is with financial clarity it'll be easier for you to make decisions that will help you make wise decisions. What do you think? Are you willing to spend some time and effort and know if you can afford to leave before you start the sales process? Why don't you click here and send me an email letting me know what you think. I actually read and answer all emails I get.